Kids movies that take the time and trouble to be enjoyable by and accessible to grownups have a special place in my heart, especially when they’re fairly smart and creatively designed. 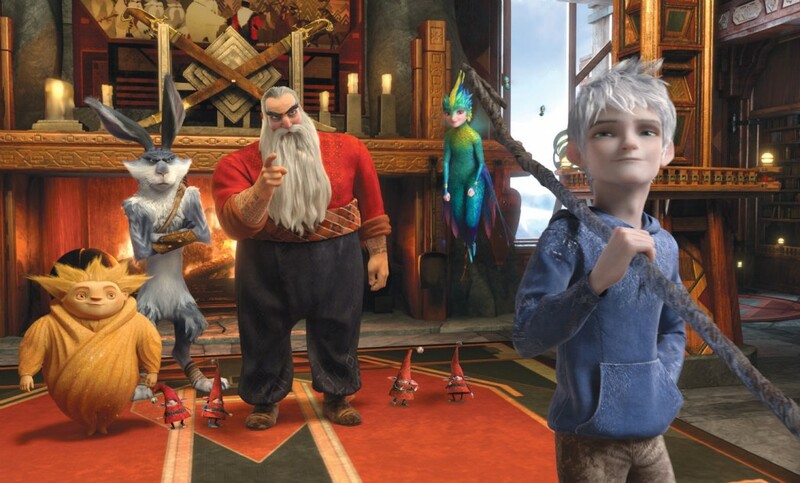 “Rise of the Guardians” falls into this camp, and I enjoyed the first hour and twenty minutes enough to forgive the last ten for not living up to their promise. Our protagonist is Jack Frost (voiced by Chris Pine), who has no memories before he awoke in dark and cold and was given his name by the Moon. He can control winter weather, and loves starting snowball fights and taking kids on wild sledding adventures — but humans can’t see him, and he has no idea what his real purpose is. When he’s recruited by The Guardians to join their ranks and fight the Boogey Man, Pitch (voiced by Jude Law), he’s skeptical. But they clearly know things he doesn’t about the whole supernatural-entity thing, so he tags along for the adventure. The other Guardians are a delight of character design. There’s Bunny (voiced by Hugh Jackman), who is essentially an Australian warrior rabbit, tall and armed with twin boomerangs. He’s skeptical of pretty much everything, especially Jack’s usefulness. Tooth (voiced by Isla Fisher) and her army of tiny hummingbird-like sprites collect children’s teeth — and by doing so, protect their childhood memories. Sandy (who speaks entirely through gesture and by making symbols appear over his head) brings good dreams to children, and is both very strong and very vulnerable to Pitch’s powers. Then there’s North (voiced by Alec Baldwin), who is a broad, jolly, Russian warrior — with “Naughty” and “Nice” tattooed on his forearms. Each Guardian has a lair reflecting their personalities, and part of the wonder running through “Rise of the Guardians” is the incredibly detailed design and creativity that’s gone into them. This is a film that will reward repeat viewings, giving folks a chance to spot background details they missed the first time around. Pitch makes for a great villain, all shades of grey and black, able to pass through shadows unseen and summon massive Night mares, who look like cousins of the Ringwraith’s steeds from “Lord of the Rings.” Nobody believes in him anymore, thanks to the work of the Guardians, so humans can’t see him, and he’s isolated and alone. His attempts to lure Jack over to his side by playing up their mutual loneliness nearly succeed, and it’s easy to see why. We’ve all felt invisible and unimportant at some point, and it’s an awful feeling. It’s easy to see why Pitch has concocted his plot to make everyone believe in him again and not in the Guardians. I was hoping for an ending which built on the sympathy Jack feels for Pitch, but instead got a fairly standard kids-movie ending. It left the underlying theme of the film — that everyone has an inner purpose, a center that forms their reason for being — intact, so it wasn’t a total wash, but it was still disappointing. On the bright side, for some parents the film will likely serve as a useful jumping-off point for a conversation with their kids about how enemies are people too, and compassion is important. “Rise of the Guardians” is a gorgeous film with an exciting pace and a solid theme. It’s not for folks who demand complete accuracy or internationalism from their childhood myths (this is a solidly European/American film, and it takes serious liberties with some of the childhood figures), anyone who still gasps in wonder at a beautifully-designed kids movie must not miss it.